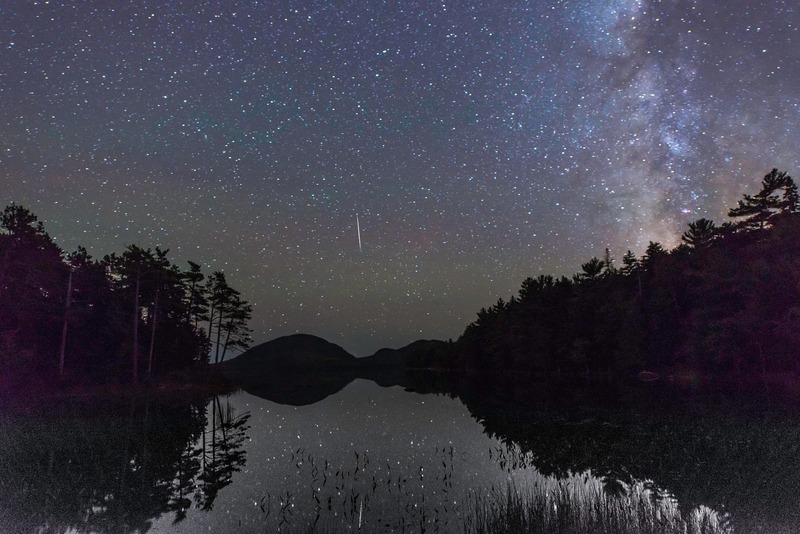 BAR HARBOR, Maine - The Acadia Night Sky Festival planning committee wants to see how you interpret our 4.6-billion-year-old solar system with its fifth annual Acadia Night Sky Festival poster contest. The annual event is approaching its tenth year and is looking to find the next iconic image to represent this tremendously popular festival. "We're looking for a unique take on what we see every night," stated Alf Anderson, co-chair of the Acadia Night Sky Festival marketing committee. "Art submissions should portray the night sky above Acadia and/or Downeast Maine. The winning image will hint to these locations in a recognizable way, with celestial objects included." For the past nine years, the festival has grown from a small base of local participants to a full-fledged experience featuring dozens of workshops and renowned researchers. From stargazing atop Cadillac Mountain to evening cruises on Frenchman Bay to telescope lessons, visitors come to Mount Desert Island from across the U.S. and Canada to enjoy the crystal-clear viewing experience that Acadia's night sky has to offer. All photographers and artists over the age of 18 are welcome to apply. To be considered for the festival's 2018 (and 10th anniversary) poster image and marketing materials, all submissions must be original, depict Acadia and/or Downeast Maine's stellar night sky, and be high resolution. "This is one of our favorite contests of the year," noted Anderson. "We look forward to seeing how others throughout the country - not just the locals - view our amazing night skies." The contest began accepting submissions on Thursday, February 1, 2018, and will close on Friday, March 16, 2018. The winning image will be featured on the 2018 festival poster, brochure, website, and all related marketing materials. In addition, the chosen artist will receive two round-trip tickets between Bar Harbor and Boston, courtesy of Cape Air. For full terms and conditions, please visit acadianightskyfestival.org. Bar Harbor, Maine, (www.visitbarharbor.com) is the gateway to Acadia National Park, one of the nation's most visited national parks, and the largest community on Mount Desert Island. Visitors from around the world come to Bar Harbor to experience the region's dramatic, varied scenery and see the historic summer "cottages" that were once the summer retreats of America's wealthiest families. A five-hour drive from Boston and 50 miles from Bangor International Airport, Bar Harbor is the heart of island activity, including shopping, dining, entertainment and organized travel experiences. With a thriving year-round population, it also serves as the Downeast region's center of economic activity, supporting a wide range of industries ranging from lobstering and boat building to banking and biomedical research.